When I put out the call for help last week for Clemson’s homecoming weekend, I was more than thrilled to get an email from an old Clemson friend, a sorority sister of mine, Michelle DiMaio. 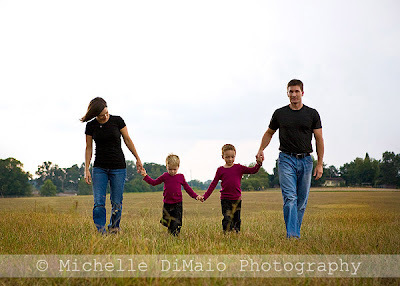 Michelle owns and runs her own photography business, Michelle DiMaio Photography, that specializes in natural light photography of newborns, babies, toddlers, and children. She took some amazing pictures for us this weekend, so I just had to share more of what she can do so you could see how truly talented she is…and maybe you’ll be swayed to give her a call and let her capture special moments of your little ones! 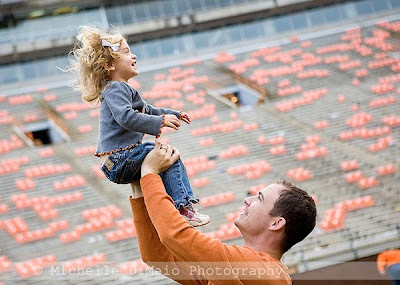 Michelle is a 2001 Clemson alum, married to a fellow alum, who grew up in Charleston in a full family of Clemson alumni. 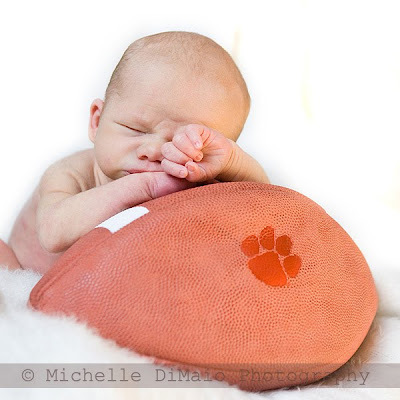 She is now raising her own Clemson family with three adorable kids - two boys ages 6 and 4, and a beautiful little girl, age 2. 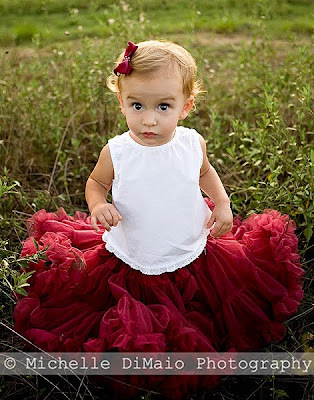 Michelle’s passion is photographing children, and you can tell from her work that she has an eye for capturing the sweet sides and personalities of these cuties. 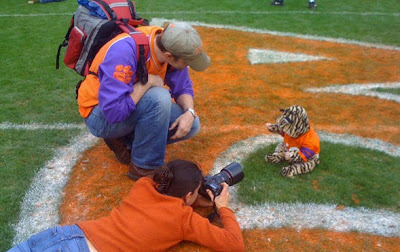 Michelle photographs in Clemson, Anderson, and Seneca – and sometimes on limited occasions in Charleston. 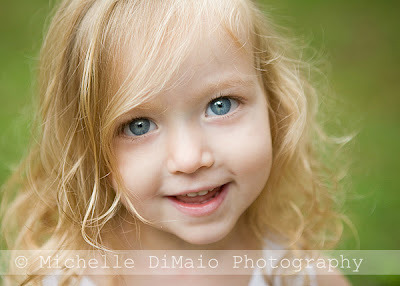 She works exclusively "on location" and photographs children outdoors at a local park or indoors and outdoors at your home. 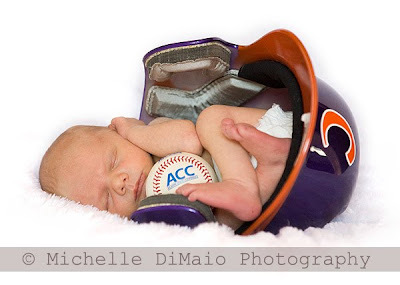 Visit Michelle’s Web site to read more details about her sessions, how to book, pricing, and how to contact her – make sure you schedule early (especially for newborns), she gets booked weeks (and sometimes months) in advance! Here is by far my favorite photo from the photos she took homecoming weekend – and the most viewed photo of the set so far. 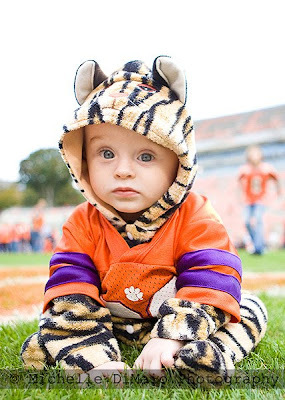 Don’t you just want to scoop up this little Tiger and squeeze him! What a cutie! This Tiger cub’s mom, Ellyn Reeder, sent us pictures on Twitter of Michelle capturing this moment – you know someone must be passionate about getting the perfect shot if she’s willing to lay down on the muddy, wet field..on her stomach no less..to get the picture. Michelle just emailed me and said she actually has orange paint stains on her jeans - but said it was totally worth it to get this shot. 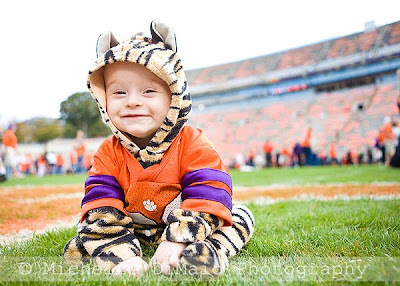 So please take the time to visit Michelle DiMaio’s Web site - http://michelledimaiophotography.com/ – and visit her photos from our Clemson Homecoming photo album and comment on your favorites. You can also keep track of Michelle and her photos by becoming a fan of her Facebook page. Thanks Michelle for helping us out and for sharing your talent with us!